The Egyptian FA appointed on Monday Hector Cuper as the new boss of the Egyptian football national team, a surprise choice since the Argentinean coach was never announced as a candidate for the job. "We have reached an agreement to appoint Cuper as the national team coach," FA spokesman Azmy Megahed said in a press conference. "Cuper will get $50,000 per month," he added. The FA has also appointed former Zamalek player Osama Nabih as assistant coach and Ahmed Nagi as keepers coach. Two more assistants to Cuper are yet to be installed. "We are optimistic after the signing of Cuper," said FA board member Mahmoud El-Shamy. "The coach's contract will be cancelled should he fail to guide the national team to the 2018 World Cup," he added, without revealing the length of the contract. Egypt last reached the World Cup in 1990. They will start the 2017 African Cup qualifiers in June then the 2018 World Cup qualifiers in October. The Pharaohs were on the lookout for a new boss after Shawky Gharib had been sacked in November following their staggering failure to qualify for the Nations Cup for the third time in a row. 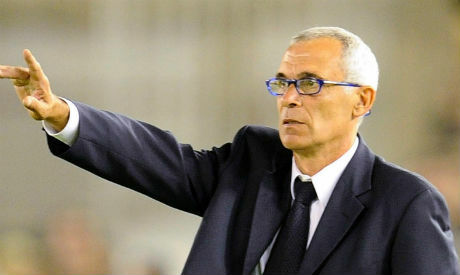 Cuper emerged as a last-minute choice for the Egyptian FA, who hadn't initially shortlisted him for the manager position. Frenchman Herve Renard was the frontrunner alongside four other candidates in Alain Giresse, Georges Leekens, Uli Stielike and Frank Rijkaard. The FA lost interest in Renard, an African Champions League winning coach, due to his financial demands. After failing to reach an agreement with any of the foreign candidates, the FA considered re-hiring Egyptian Hassan Shehata who led Egypt to three consecutive Nations Cup titles from 2006 to 2010. But Monday's FA board meeting ruled out the option of bringing Shehata back at the helm and voted for free-agent Cuper, who was the most affordable among all candidates. Cuper was previously in charge of Valencia, Inter Milan, Mallorca and Real Betis, among other clubs. Seven-time Nations Cup winners Egypt will be the second national team for Cuper to manage after Georgia. The heyday of the 59-year-old as a manager was in the late 1990s, having won the Spainish Super Cup twice with Real Mallorca and Valencia in 1998 and 1999 respectively. However, Cuper has a history of leading his teams to runners-up finishes. He made a flying start to his managerial career, leading Huracan to second place in the Argentinean championship in 1994 after losing to Independiente, who were a single point ahead on top. In 1998, in his first season with Mallorca, Cuper reached the final of the Copa Del Rey. After a 1-1 draw and the team finishing the game with nine men due to the dismissal of Mena and Romero, they lost on penalties to the mighty Barcelona 5-4. In 1999 he led Mallorca to the final of the UEFA Cup, though eventually losing 2-1 to Lazio, courtesy of a late goal from Pavel Nedved. Moving to Valencia, Cuper continued to oversee some fantastic football, leading them to the final of the UEFA Champions League twice in a row. However, they lost 3-0 to Real Madrid in 2000 and to Bayern Munich on penalties after a 1-1 draw in 2001. In 2003 he threw away the Scuedetto title as Inter Milan lost 4-2 to Lazio in the final game of the season, handing the title to fierce rivals Juventus. And finally in 2010, Cuper led Aris to the final of the Greek Cup but his outfit were beaten 1-0 by Panathinaikos. I'm 54 years old and saw Egypt just ONCE in the world cup! After each failure we change the coach, but has anyone thought maybe it's the players? We need to set a system that promotes young players and nurtures them till they reach world class. But I guess it's easier to change the coach! !